Where can I find Linux mint drivers for my Dell Inspiron network card? I have installed Mint 9 on my Dell Inspiron n3010 and it does seem to recognize neither my network nor my wireless card. As such, I have no access to internet unless I boot Windows. No, that didn't work me. Faiz,I am away from my laptop but if you go to the Dell website and provide them with your service number the site will provide you a list of compatible Windows drivers. Just try everything with wifi in it. Hey, I'm having the same problem on my Dell laptop. Could you please explain how you manged to resolve your problem ? I got it. I used this solution (http://linuxwireless.org/download/compat-wireless-2.6) for nerwork while for wifi I manually found the inf file after unpacking the windows driver on the dell site and double-clicked it to run in terminal. Andy I'm glad to hear that you found a way to use your wireless as well as your network. I have the exact same dell n3010 and have been facing the same problem as yours. Could you tell which driver on dell site did you download? "It will say searching for hardware drivers. Then when it comes up click on your wireless driver which I am assuming it is the Broadcom STA wireless driver." Only that, since I cannot connect to anything via cable I made a print-screen of the error message and downloaded the drivers manually from ubuntu.com from a different system. "These package contains Broadcom 802.11 Linux STA wireless driverfor use with Broadcom's BCM4311-, BCM4312-, BCM4321-, andBCM4322-based hardware. "drivers activated but not in use" (see http://imgur.com/EhEkR.png). All you need to is find the Windows wireless driver .inf file somewhere on your hard disk. And that's it. The long manual configurations are no longer needed. That's it. possible this, It should work regardless of the distribution. It will say searching for hardware drivers. 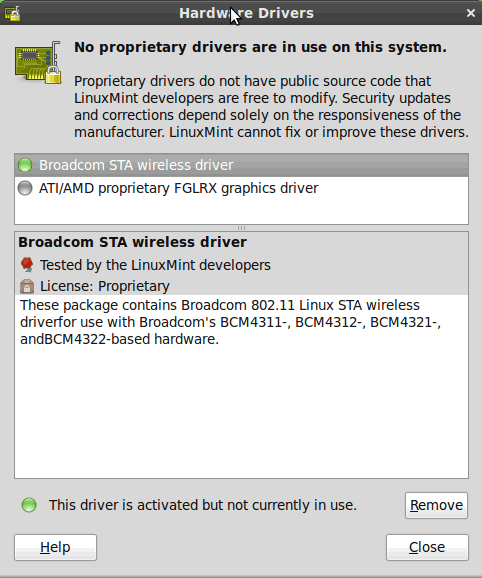 Then when it comes up click on your wireless driver which I am assuming it is the Broadcom STA wireless driver. Click on it and on the bottom right of the box there will be a button that says activate. It is very important that you are connected to your router with an ethernet cable so that you can download the driver and it will activate it once it is downloaded and you will be able to use your wireless. go into Synaptic Package Manager and search for "broadcom". After reinstalling those drivers, reboot, and the system will find the wireless drivers with no problem. Thanks ha14. I do not have a dial-up connection to the Internet. I have a cable connection to which I normally connect via wireless (if needed i can plug in a cable however). start a terminal session, then type: iwconfig or ifconfig you might see something like: eth0 (this is your ethernet port) lo (this is your local loopback) and possibly wlan0 (this will be your wireless card). Identify the modem with the ScanModem tool or wvdialconf. Download, configure and install driver. If needed, it's often more economical to buy an easy one. for users of your Dell Inspiron model this might be obviousl, but for everyone else, could you please specify the network card in your computer? Thank you.